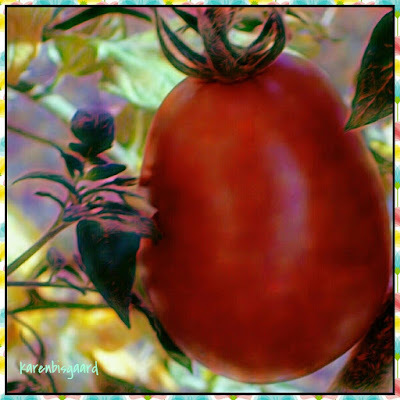 Karen`s Nature Photography: Red Tomato. Green Leaves Surrounded by Yellow Leaves. Autumn Leaves in Front of Stone Fence. Row of Birch Trees in Garden. Fluffy Dandelion Seedhead in Lawn. Parasol Mushrooms on Forest Floor. Big Mushroom on Forest Floor. Annual Honesty and Red Berries. Hollyhock Bud Covered in Dew. Decaying Annual Honesty Seed Capsules. Leaf Skeleton and Green Straws.